There is nothing more satisfying for a metalhead and now Album Reviewer than to connect with fellow music lovers and musicians online and get kickass suggestions to listen to. The metal community is huge and worldwide and yet there is a sense of being a family. 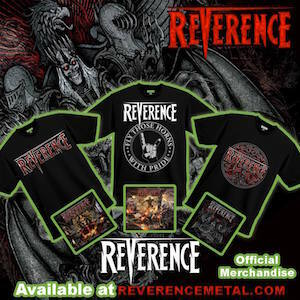 I recently received some goodies in regards to a band called Reverence who formed in 2010 and hail from Detroit, Michigan. The band members are Steve “Doc” Wacholz – Drums, Bryan Holland – Guitars, Russell Pzutto – Bass, Scott Oliva – Vocals and Paul Kleff – Guitars. The names may sound familiar to seasoned metal connoisseurs and indeed these men have played in various other bands. Experience leads to glory. Off their upcoming release Foreverence, ‘Fire Lord’ crushes and engrosses you to your spinal cord nerve endings. Guitar riffs like serrated blades, thundercloud and brimstone drumming and badass icy edgy vocals make total impact. Reverence delivers with raw finesse. This is how power metal is done!